Simply finishing the writing of the constitution did not mean that it was fully embraced by the country. In fact, the ratification process for this constitution was highly controversial and took much longer than many realize. Before finishing the document 16 of the original 55 delegates would actually leave the building as a protest against what was decided. 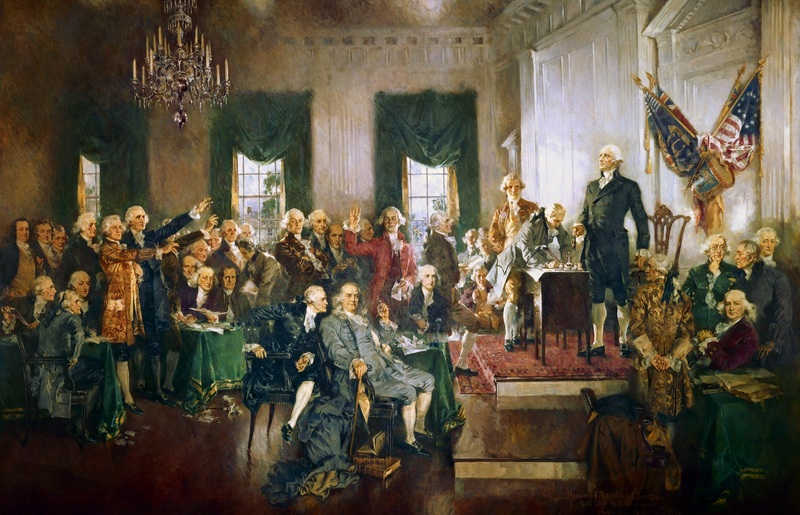 The loss of these men signified a real issue with ratification, since the Articles of Confederation said that all 13 states had to agree to any change. With only 9 states officially agreeing, the best they could hope for was to isolate the remaining states and force them to give in and sign the document. The 9 states would officially ratify the constitution (1788) and a huge propaganda movement would be made to try to sway opinion in the 4 states that held out (New York, Virginia, North Carolina, and Rhode Island). possibility of any strong government being able to take their liberties away and didn’t like that the constitution didn’t give any specific rights to the people. Where each individual fell in this debate usually had a great deal to do with which style would help them the most. Farmers tended to be Anti-Federalists since they just wanted to be left alone, while merchants and shippers were usually Federalists since they wanted the central government to make solid trade agreements with other countries. Three of the four countries would ratify the new constitution by narrow margins, but the state of New York continued to hold out. Federalist leaders started to write propaganda essays to try to persuade the people of New York to vote in favor of ratification. These essays were officially anonymous, but it was made clear later that they were written mainly by Alexander Hamilton, James Madison, and John Jay. These essays explained, in detail, why this strong government was important and wouldn’t trample the rights of normal citizens. To this day, these are regarded as some of the finest political writings in the world, and give a bit of a window into the thoughts of the founding fathers on many subjects. Despite the well written essays, they may have had little to do with the eventual ratification of the constitution in New York. The state would only agree when it was clear that a sizable portion of the citizens were ready to secede from the state. The official ratification would involve another compromise between the Federalists and the Anti-Federalists. The Anti-Federalists would agree to sign only after it was agreed that a Bill of Rights would be added to the constitution to give specific protections to the people. This would be done in a committee of the new Congress in 1791 and was led by James Madison. They would create the first 10 amendments to the constitution, which collectively are known as the Bill of Rights. Doing this eased the fears of the Anti-Federalists of a tyrannical government enough to allow them to agree to it.